The Porter Cable PCE201 is one of kind. 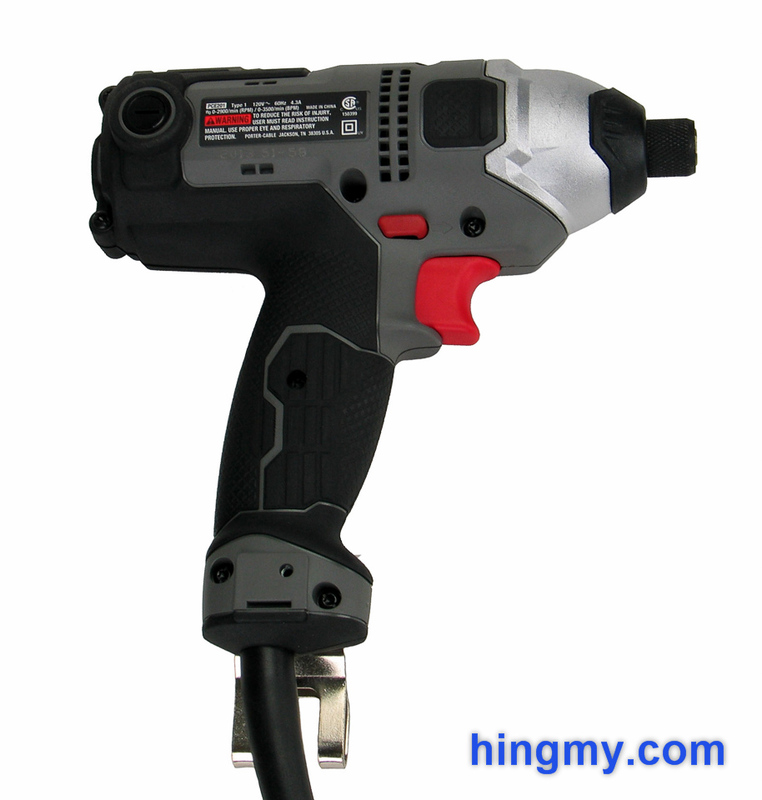 It is the only high-torque corded impact driver in the Hingmy database at the moment. AC power gives this driver performance numbers that few cordless impact drivers can match. Let's take a look at what you can get, if you are willing to tether your impact driver to the power grid. 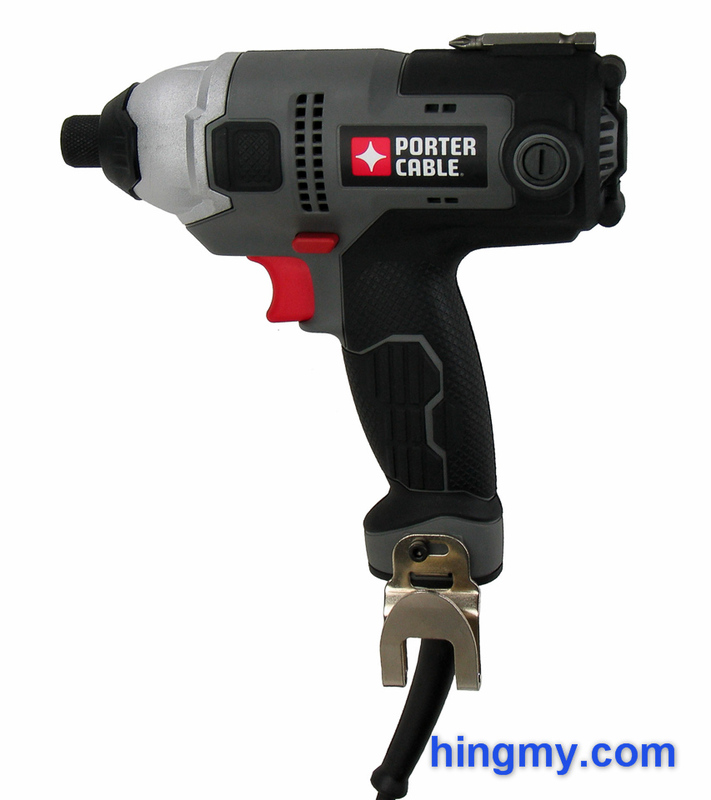 The PCE201 is a corded impact driver with a 1/4" hex chuck from Porter Cable. It is the only corded screwdriver that was designed to driver general purpose fasteners, which sets it apart from the competition that concentrates on driving drywall screws. This unique design puts the PCE201 into direct competition with cordless drivers. Its strongest asset is a 4.3 amp grid powered motor that delivers 121 ft-lbs of torque. Build quality is good all around. Black rubber covers the grip and all exposed edges. There are no lose parts or moving seams. The scent of burnt plastic lies in the air until the motor brushes wear in, but dissipates soon enough and does not return. A small access hatch on each side of the body makes brush changes a painless affair. Without having to accommodate a battery the PCE201 is noticeable lighter than the average full-size cordless driver. Vertical balance is poor, since there is no weight below the grip to offset the heavy barrel of the driver. At first the PCE201 feels a little awkward in your hand, but you'll get used to this new type of impact driver soon enough. The PCE201 offers great power tethered to a socket. Its average top speed keep it from being truly great. The all-metal hex chuck at the tip of the tool secures bits well. You'll never find bits stuck to a screw tip with the PCE201. Operating the chuck while wearing gloves feels comfortable. The chuck does eject bits when opened, but it could do so with a little more force. The power cord of the PCE201 is only 6 ft long. That's well below the 10 ft I'd expect from a tool like this, and not even in the same range as the cords of some drywall screwdrivers. Having to drag around a coupler this close to the driver gets annoying. Commercial users should budget for a longer replacement cord. The deep belt hook secures the driver on a tool belt without any danger of it coming lose. The hook attaches on both sides of the driver for right and left-handed use. The engineers added a brilliant magnetic bit holder on top of the driver. It holds only one bit, but whatever you place in it stays put until you need it. The through-the-body style direction selector switch works well, but feels a little mushy. It has no trigger lock in the center position, which eliminates ambiguous switch positions at the cost of not being able to lock the trigger. Similarly lackluster, the trigger lacks attention to detail. Selecting a specific speed takes little effort, but holding it or coming back to it is hard. The trigger is simply too loose to make precise changes in motor rpm. While working on a project you'll soon forget about this issue, but the difference in quality will be apparent when you pick up a premier cordless driver. As expected the top-end torque of the PCE201 is excellent. It matches the power output of the most powerful cordless drivers on the market today. 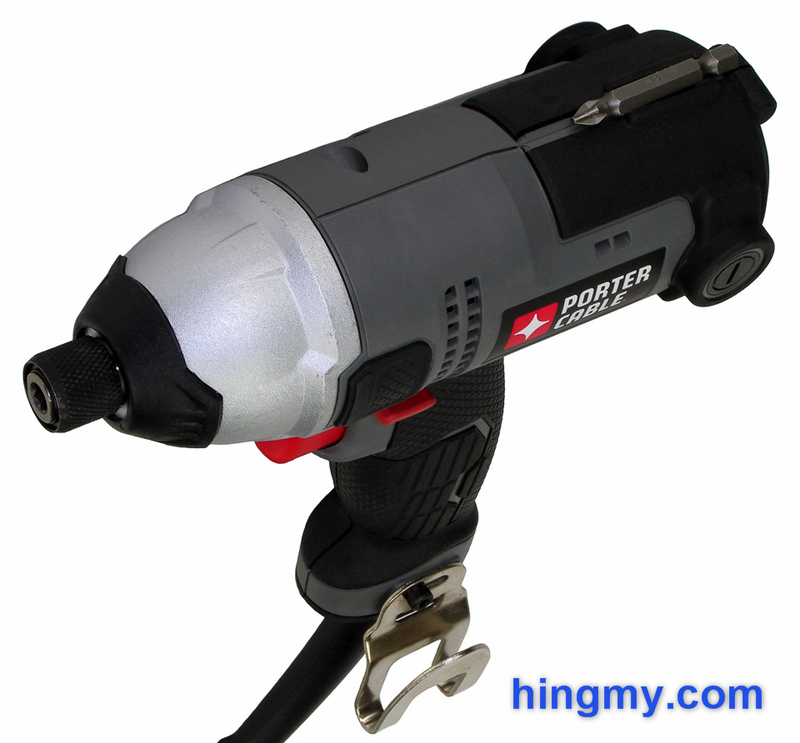 Equipped with the appropriate adapter it'll double as a low to medium power impact wrench. This driver's strong suit, however, is driving screws. The AC cord gives the PCE201 unlimited endurance. It'll drive as many screws as you want it to, which I consider the main value proposition of this driver. The gear housing will be uncomfortably hot after driving the first hundred fasteners, but the PCE201 will keep on going all day long. Its overall life expectancy is somewhat unclear, but I am sure you'll get fair value considering the low price this driver is selling for. The driver's top speed is ok for a standard impact driver, but curiously low for a tool that drives fasteners by the bucket load. The PCE201 won't speed up your work compared to cordless drivers. To make matters worse, the hammer gear engages only 1/3 of the way into driving a 3" screw into construction grade lumber. This further slows the driver down, and increases its noise output. There are cordless drivers that get the job done faster than the PCE201. Overall the PCE201 offers great single fastener performance. It'll do whatever other drivers can do, and most of the time it'll do it better. Unfortunately it won't speed up your work significantly, if you have a bucket of screws to install. The PCE201 delivers as much torque as the best cordless drivers on the market. The power cord will have you working all day long without having to stop for a recharge. The driver's average driving speed, however, prevents you from working any faster than you can with a good cordless driver. The short power cord and hot hammer gear add a couple of announces that keep this driver from carving out a clear niche for itself. While it may only be as good as the best cordless drivers, the PCE201 cost considerably less. If you are willing to deal with the power cord, this driver offers a lot of performance for you money. Heavy-duty users can risk taking a look, but the PCE201's lifespan will probably match its price tag in a truly tough environment.